This vintage look throw is not a complicated pattern, but will keep your interest while making it. The example is made in light worsted weight mercanized cotton. The beginning chain should be a multiple of 48 plus 41. Written instructions are provided for the first 13 rows only. Please refer to the chart (click the word chart) for full instructions. Repeat stitches between red lines across the row. Repeat rows between the blue lines until the blanket is the desired length. Row 1: Dc in 4th ch from hook, dc in each ch across row. Row 2: Ch 3, turn. Dc in 2nd dc and in each dc across to end of row. Dc in top of turning ch. Row 3: Ch 3, turn. Dc in 2nd dc, dc in each of next 9 dc, ** ch 1, skip 1 dc, dc in each of next 15 dc. Repeat from ** to last 11 dc and turning ch. Ch 1, skip 1 dc, dc in each of next 10 dc. Dc in top of turning ch. Row 4: Ch 3, turn. Dc in 2nd dc, dc in each of next 7 dc, ch 4, skip 2 dc, dc in ch sp, ch 4, skip 2 dc, dc in each of next 11 dc, ch 4, skip 2 dc, dc in ch sp, ch 4, ** skip 2 dc, dc in each of next 11 dc, ch 1, skip 1 dc, dc in next dc, ch 1, skip ch sp, dc in next dc, ch 1, skip 1 dc, dc in each of next 11 dc, ch 4, skip 2 dc, dc in ch sp, ch 4, skip 2 dc, dc in each of next 11 dc, ch 4, skip 2 dc, dc in ch sp, ch 4. Repeat from ** to last 12 dc and turning ch. Skip 2 dc, dc in each of last 8 dc. Dc in top of turning ch. Row 5: Ch 3, turn. Dc in 2nd dc, dc in each of next 5 dc, ch 4, skip 2 dc, sc in ch sp, sc in dc, sc in ch sp, ch 4, skip 2 dc, dc in each of next 7 dc, ch 4, skip 2 dc, sc in ch sp, sc in dc, sc in ch sp, ch 4, ** skip 2 dc, dc in each of next 7 dc, ch 1, (skip 1 dc, dc in next dc, ch 1) four times, skip 1 dc, dc in each of next 7 dc, ch 4, skip 2 dc, sc in ch sp, sc in dc, sc in ch sp, ch 4, skip 2 dc, dc in each of next 7 dc, ch 4, skip 2 dc, sc in ch sp, sc in dc, sc in ch sp, ch 4. Repeat from ** to last 8 dc and turning ch. Skip 2 dc, dc in each of last 6 dc. Dc in top of turning ch. Row 6: Ch 3, turn. Dc in 2nd dc, dc in each of next 3 dc, ch 4, skip 2 dc, sc in ch sp, sc in each of 3 sc, sc in ch sp, ch 4, skip 2 dc, dc in each of next 3 dc, ch 4, skip 2 dc, sc in ch sp, sc in each of 3 sc, sc in ch sp, ch 4, ** skip 2 dc, dc in each of next 3 dc, (ch 1, skip 1 dc, dc in next dc) three times, dc in ch sp, dc in dc, (ch 1, skip 1 dc, dc in next dc) three times, dc in next two dc, ch 4, skip 2 dc, sc in ch sp, sc in each of 3 sc, sc in ch sp, ch 4, skip 2 dc, dc in each of next 3 dc, ch 4, skip 2 dc, sc in ch sp, sc in each of 3 sc, sc in ch sp, ch 4. Repeat from ** to last 6 dc and turning ch. Skip 2 dc, dc in each of last 4 dc. Dc in top of turning ch. Row 7: Ch 3, turn. Dc in 2nd dc, dc in each of next 3 dc, 2 dc in ch sp, ch 4, skip 1 sc, sc in each of next 3 sc, skip 1 sc, ch 4, 2 dc in ch sp, dc in next dc, ch 1, skip 1 dc, dc in next dc, 2 dc in ch sp, ch 4, skip 1 sc, sc in each of next 3 sc, skip 1 sc, ch 4, 2 dc in ch sp, ** dc in next dc, ch 1, skip 1 dc, dc in next dc, (ch 1, dc in next dc) twice, dc in ch sp, dc in next dc, ch 1, skip 1 dc, dc in next dc, dc in ch sp, dc in next dc, (ch 1, dc in next dc) twice, ch 1, skip 1 dc, dc in next dc, 2 dc in ch sp, ch 4, skip 1 sc, sc in each of next 3 sc, skip 1 sc, ch 4, 2 dc in ch sp, dc in next dc, ch 1, skip 1 dc, dc in next dc, 2 dc in ch sp, ch 4, skip 1 sc, sc in each of next 3 sc, skip 1 sc, ch 4, 2 dc in ch sp. Repeat from ** to last 4 dc and turning ch. Dc in each of last 4 dc. Dc in top of turning ch. Row 8: Ch 3, turn. Dc in 2nd dc, dc in each of next 5 dc, 2 dc in ch sp, ch 4, skip 1 sc, dc in next sc, skip 1 sc, ch 4, 2 dc in ch sp, dc in next dc, ch 4, skip 2 dc, dc in ch sp, ch 4, skip 2 dc, dc in next dc, 2 dc in ch sp, ch 4, skip 1 sc, dc in next sc, skip 1 sc, ch 4, 2 dc in ch sp, ** dc in next dc, ch 1, skip 1 dc, dc in next dc, (ch 1, dc in next dc) twice, dc in ch sp, dc in next dc, ch 4, skip 2 dc, dc in ch sp, ch 4, skip 2 dc, dc in next dc, dc in ch sp, dc in next dc, ch 1, skip 1 dc, dc in next dc, (ch 1, dc in next dc) twice, ch 1, skip 1 dc, dc in next dc, 2 dc in ch sp, ch 4, skip 1 sc, dc in next sc, skip 1 sc, ch 4, 2 dc in ch sp, dc in next dc, ch 4, skip 2 dc, dc in ch sp, ch 4, skip 2 dc, dc in next dc, 2 dc in ch sp, ch 4, skip 1 sc, dc in next sc, skip 1 sc, ch 4, 2 dc in ch sp. Repeat from ** to last 6 dc and turning ch. Dc in each of last 6 dc. Dc in top of turning ch. Row 9: Ch 3, turn. Dc in 2nd dc, dc in each of next 7 dc, 2 dc in ch sp, ch 1, 2 dc in next ch sp, dc in next dc, ch 4, skip 2 dc, sc in ch sp, sc in dc, sc in ch sp, ch 4, skip 2 dc, dc in next dc, 2 dc in ch sp, ch 1, 2 dc in next ch sp, ** dc in next dc, ch 1, skip 1 dc, dc in next dc, (ch 1, dc in next dc) twice, dc in ch sp, dc in next dc, ch 4, skip 2 dc, sc in ch sp, sc in dc, sc in ch sp, ch 4, skip 2 dc, dc in next dc, dc in ch sp, dc in next dc, ch 1, skip 1 dc, dc in next dc, (ch 1, dc in next dc) twice, ch 1, skip 1 dc, dc in next dc, 2 dc in ch sp, ch 1, 2 dc in next ch sp, dc in next dc, ch 4, skip 2 dc, sc in ch sp, sc in dc, sc in ch sp, ch 4, skip 2 dc, dc in next dc, 2 dc in ch sp, ch 1, 2 dc in next ch sp. Repeat from ** to last 8 dc and turning ch. Dc in each of last 8 dc. Dc in top of turning ch. Row 10: Ch 3, turn. Dc in 2nd dc, dc in each of next 9 dc, dc in ch sp, dc in next dc, ch 4, skip 2 dc, sc in ch sp, sc in each of 3 sc, sc in ch sp, ch 4, skip 2 dc, dc in next dc, dc in ch sp, ** dc in next dc, ch 1, skip 1 dc, dc in next dc, (ch 1, dc in next dc) twice, dc in ch sp, dc in next dc, ch 4, skip 2 dc, sc in ch sp, sc in each of 3 sc, sc in ch sp, ch 4, skip 2 dc, dc in next dc, dc in ch sp, dc in next dc, (ch 1, dc in next dc) twice, ch 1, skip 1 dc, dc in next dc, dc in ch sp, dc in next dc, ch 4, skip 2 dc, sc in ch sp, sc in each of 3 sc, sc in ch sp, ch 4, skip 2 dc, dc in next dc, dc in ch sp. Repeat from ** to last 10 dc and turning ch. Dc in each of last 10 dc. Dc in top of turning ch. Row 11: Ch 3, turn. Dc in 2nd dc, dc in each of next 9 dc, ch 1, skip 1 dc, dc in next dc, 2 dc in ch sp, ch 4, skip 1 sc, sc in each of next 3 sc, skip 1 sc, ch 4, 2 dc in ch sp, dc in next dc, ** ch 1, skip 1 dc, dc in next dc, dc in ch sp, dc in next dc, (ch 1, dc in next dc) twice, 2 dc in ch sp, ch 4, skip 1 sc, sc in each of next 3 sc, skip 1 sc, ch 4, 2 dc in ch sp, dc in next dc, (ch 1, dc in next dc) twice, dc in ch sp, dc in next dc, ch1, skip 1 dc, dc in next dc, 2 dc in ch sp, ch 4, skip 1 sc, sc in each of next 3 sc, skip 1 sc, ch 4, 2 dc in ch sp, dc in next dc. Repeat from ** to last 11 dc and turning ch. Ch 1, skip 1 dc, dc in each of next 10 dc, dc in top of turning ch. Row 12: Ch 3, turn. Dc in 2nd dc, dc in each of next 7 dc, ch 4, skip 2 dc, dc in ch sp, ch 4, skip 2 dc, dc in next dc, 2 dc in ch sp, ch 4, skip 1 sc, dc in next sc, skip 1 sc, ch 4, 2 dc in ch sp, dc in next dc, ch 4, skip 2 dc, dc in ch sp, ch 4, ** skip 2 dc, dc in next dc, dc in ch sp, dc in next dc, (ch 1, dc in next dc) twice, 2 dc in ch sp, ch 4, skip 1 sc, dc in next sc, skip 1 sc, ch 4, 2 dc in ch sp, dc in next dc, (ch 1, dc in next dc) twice, dc in ch sp, dc in next dc, ch 4, skip 2 dc, dc in ch sp, ch 4, skip 2 dc, dc in next dc, 2 dc in ch sp, ch 4, skip 1 sc, dc in next sc, skip 1 sc, ch 4, 2 dc in ch sp, dc in next dc, ch 4, skip 2 dc, dc in ch sp, ch 4. Repeat from ** to last 12 dc and turning ch. Skip 2 dc, dc in each of last 8 dc. Dc in top of turning ch. Row 13: Ch 3, turn. Dc in 2nd dc, dc in each of next 5 dc, ch 4, skip 2 dc, sc in ch sp, sc in dc, sc in ch sp, ch 4, skip 2 dc, dc in next dc, 2 dc in ch sp, ch 1, 2 dc in next ch sp, dc in next dc, ch 4, skip 2 dc, sc in ch sp, sc in dc, sc in ch sp, ch 4, ** skip 2 dc, dc in next dc, dc in ch sp, dc in next dc, (ch 1, dc in next dc) twice, 2 dc in ch sp, ch 1, 2 dc in next ch sp, dc in next dc, (ch 1, dc in next dc) twice, dc in ch sp, dc in next dc, ch 4, skip 2 dc, sc in ch sp, sc in dc, sc in ch sp, ch 4, skip 2 dc, dc in next dc, 2 dc in ch sp, ch 1, 2 dc in next ch sp, dc in next dc, ch 4, skip 2 dc, sc in ch sp, sc in dc, sc in ch sp, ch 4. Repeat from ** to last 8 dc and turning ch. Skip 2 dc, dc in each of last 6 dc. Dc in top of turning ch. 2/15/15 – added two missing stitches to the center of row 7. 7/29/17 – moved “dc in ch sp, dc in next dc,” in row 7. I was just doing my daily browsing on Ravelry and there you were! Fabulous patterns! Love the choice of sizes. You can bet I will be making most of these projects! Thank you for posting them. I love your Spider Lace Throw and have started it. Have there been any corrections to this pattern? I found an error in Row 6 but was able to correct it. I am on Row 8 and am not able to get it to work out. I even repeated Row 7 but Row 8 still isn’t working out. I love all your patterns and really want to make this one. Please advise if there are errors in this pattern. I’d love to know what you found on row 6. I hope you realize that I only have 13 rows written out of a 43 row pattern. I gave up writing it and resorted to making a chart. I do want to correct any errors in those 13 rows, but I don’t know if or when I can ever write out the rest of it, so this is really a chart pattern only. Had the same problem. Desperate to get this to work for a wedding present in November. Tried the chart and row six was still a disaster. Did you find any errors? I haven’t found any errors and no one has pointed any out. Could you send me a picture of what you have and maybe I can figure out the problem. I wish I knew more about what was happening after row 7. I have seen several posted pictures on Ravelry that other people have made using the chart and none of them noted any errors in it. hi there. I just wanted to thank you for posting your beautiful afghan patterns. I love the size choices. And you’ve made it very easy to print the patterns, unlike some sites I’ve been too. I want to crochet an afghan for my daughter-in-law. Now all I have to do is choose which one. I love this throw! I’ve been looking for something to top a pencil post bed with a flat canopy that I’m getting. Now I’ve found it! Thank you so much! Love this pattern! Was wondering if someone could email me the chart? My computer wont let me open it up! I’ve e-mailed it. Let me know if it doesn’t work. I don’t even SEE a chart here. Could you email it to me also please? Click the word chart and it will open. I am having a similar issue. When I click on “chart” it opens a new tab but that’s as far as it will go. It’s a blank screen. Did you happen to take it down? I wonder if it’s too large to load in your browser? I’ll e-mail it to you. I’m on the net every day. WHY am I just now discovering your site? Thank you for the ease and beauty of your designs. Very easily read and very easy to follow your directions. Thank you so much! Love this design and am considering using the pattern. Could you email me the chart also? I couldn’t find it here. Thx! You can get to it also by clicking the word “chart”. What is a brand name of light worsted mercerized cotton yarn? I’m having trouble finding the word “mercerized” in the description. Thanks. The brand is Knitting Fever and this is their King Tut 100% cotton. Hi, I have been looking for s different lacy pattern that I could use for anything from a baby to a full queen size afghan and was thrilled to see the Spider Lace Throw. I like Doralee was unable to find/download the chart. I think I might be able to figure it out without the chart but would be much easier with. If you possibly could email it to me I would be very thankful. You have beautiful patterns and I have made a few already. Thank you. I love the pattern but can’t find the chart that you talk of. Would it be possible to receive a copy by email or a link from which I could download it. Just click the word chart and it will open it for you. I printed off the chart (thank you and it was easy to do) and the picture of the throw. I can’t wait to make this for my granddaughter’s graduation (2015). I’ve been looking for a special pattern and you did it for me. I can’t wait to try it. I love this pattern. I hope to make it soon. Have you ever used this pattern as a tablecloth? I haven’t but it would work great for that. That is information I give so that the pattern can be modified to be made any size you want. I have given the number of beginning chains for different sizes so that you don’t have to calculate it if one of those sizes works for you. 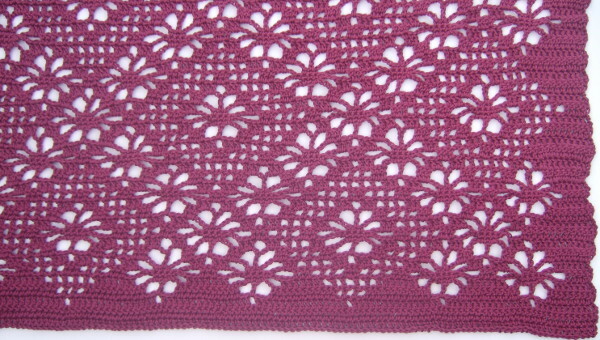 If you can email the intire pattern forspider lace flower. Do you want the written pattern or the chart? I have posted all the written instructions I have. I cannot get the rest of the pattern rows 14 through 43 i really like the pattern and would like to make it if i could only get the rest of the pattern. I would really appreciate it. Thank you in advance. The first thirteen rows should give you the idea of how the pattern goes so that then you can follow the chart. I’ll e-mail it to you. I think sometimes it is too large to load into browsers. i love this pattern, could you please email me the chart. I sent it to you via e-mail. would love to receive he pattern. Thank you. Sending via e-mail. So that I can assess what is happening with my link to the chart, what is happening when you click on it? To answer your question, I clicked on the word “chart” and got your chart right away. Thank you for making that, I have never understood chart instructions but I do understand yours, love learning new things! I love these no chain start afghan patterns i’m working another one quick & chainless shell & lace pattern at this time. It’s working up so quick & easy i’ll try this one next! Loving these thanks so much! Oh this one does have a starting chain still beautiful & still be making this one! I would love to have this pattern. Could you email it to me? Is there a problem or error with row 6? I wanted to start this pattern but didn’t want to have a problem with that row or 8 I think was the other one some one said was a problem. I haven’t been able to get anyone to tell me what error they found on row 6. This is something they are finding in the written instructions of which there are only 13 rows anyway. I know the chart is correct. There is definitely a problem with row 7. I think it lies in the parentheses. Following the chart, I was able to get through it. I believe the parentheses should include skip the ch space. Not absolutely positive, but following the directions as written doesn’t get you close enough to start the next flower. Thank you for letting me know where the problem was. I’ve corrected row 7. I cannot get the chart to print off completely so is there another way to get the chart? This pattern looks like it will be wonderful when made up. Thank you for posting it. Have a great day. I created a four page version of the pattern that will print completely on four pages. There is some overlap shaded in grey that helps you follow from page to page. I’m getting ready to start this for my king size bed. I think I made the adjustments correctly based on your instructions of a multiple of 48+41 for the starting row. I really hope it works out! I’m sure you have it right. After the starting chain amounts I gave in the pattern, other valid beginning chains are 329, 377, 425, 473, 521, 569. Finished! It’s beautiful. Thank you so much! I had a blast making this afghan! I’m terrible at directions, I do must of my work by sight. This is very pretty but wonder if you have instructions for just spider web I had it but got lost I move when my husband passed thanking you. I am not a chart worker. Would it be possible for you to provide the names of each of the symbols in the chart? I did find a few places where I thought I missed a stitch, it could be a misread on my part or a misprint, but with the diagram, and even just the picture that comes with the pattern, one can easily make up the missed stitch with the appropriate one. I think, my frustrations always center around the instruction that says (ch 1, dc in next dc) twice. Like I say, it could be me, but nevertheless it is working out and looking good. I am not the best at crochet, but find this is not too hard b/c the stitches used are basic. Thank you for the pattern. I’ve never worked with a chart before, but this whole thing turned out to be sooooo easy and beautiful!! Love, love, love it! You’re brilliant! I love this pattern so very much. One question I have is how do I print out the directions for rows up to #13 without getting all the comments? I tried highlighting the first 13 rows but I was getting all the comments that take up a whole lot of paper. If I cancel the printing after #13, the next time I try to print something the rest of the comments come along for the ride. Help!! At the very top of the pattern there is a print icon. If you use it to print, it will give you a nice print ready version without the comments. Thought I would give you an update on my progress with this. I chose to make it with 5 length-wise repeats on the lenth so it would completely cover my king-bed. I have just completed my 2nd increase and it is shaping up very nicely. I also have a big note on my pattern to send you a picture when it is finished. I figure it will be sometime this year. I have discovered that the older I get the slower I crochet – but it is worth the wait for the finished product!! Is there anyone who can make this pattern work? I have been crocheting for 30 years plus but I can’t get it to work. Besides mine, there are pictures of three more completed ones on Ravelry. Where are the problems beginning? Thanks for finding this error. I think what happened was when I added “dc in ch sp, dc in next dc,” a couple of years ago, I added it too early in the row. I moved it down a bit now and think it’s in the right place now. Just printed out this picture and the chart, since charts are easy for me to follow. This crochets up beautifully, very quickly and looks so wonderful! Thank you so much! I am working on a 4 repeat across to fit comfortably on a queen size or just as a topper on a king size bed, as I am not sure which size the intended party will have. Would you email me a copy of the chart, please? I clicked on “chart” and it came up, but when I printed, only part of it came out! Thank you for your beautiful patterns and have a wonderful day/evening! That pattern is probably too big to print on one page and have it be large enough to see. Here is a version that is formatted for four pages. I repeated some on the other pages so that you could keep up with where you are. It’s shaded, so just be sure not to do those stitches/rows twice. Thank you for this lovely pattern, especially for the chart revealing what is needed to create the different sizes. I have the habit of buying yarn when I spot it on a good sale, never having a specific pattern in mind. With your chart I can fit what I have in yarn to what size I can make! I realize it’s rather backward from the way it should be done, but now I can use your charts and create some beautiful items without fear of not having enough yarn or having too much yarn left over. My husband will be very pleased to see some of my large piles of yarn finally become something. By the end of Football Season I should have a couple projects completed. Made this in worsted weight yarn as a donation to a fund raiser that is dear to our hearts. It came out simply beautiful and inspired me to try one in thread, size 10. That may have been a crazy move, as it is a lot of stitches to make a tablecloth size piece, but it is already looking gorgeous. Thank you so much for this pattern, and especially the diagram. I made this for my Grandmother. I added a triple picot border and it is just lovely. I wish I could add a photo of it to this comment. Having trouble getting chart to print, only prints 2/3’s of the chart. No way to reduce so I can get it all. Could you sen it by email. Thanks. I wish I could read charts. Beautiful pattern! Hello, so nice to see your pattern. I Was looking for a shawl/wrap pattern, I think your pattern will work at the 66″ length. What do you think? I think that would make a fantastic wrap. I LOVE this pattern and want to make it for my daughter’s living room. I managed to copy the pattern onto a Word file (can’t follow on a computer while I crochet), but I cannot manage to copy the chart. Could you email me the chart, please? Thank you. The throw is stunning! I’m so sorry for the delay. I had a very busy week and didn’t look my messages. Emailing the chart. I’ve been reading a lot of patterns lately and am feeling a bit confused. Can you tell me if your dc is a US dc or a UK dc? My patterns are written using US stitches.